Treat a chilli fan to a personalised bottle of our delicious medium heat BBQ sauce, winner of 'Best BBQ / Marinade UK 2017'. 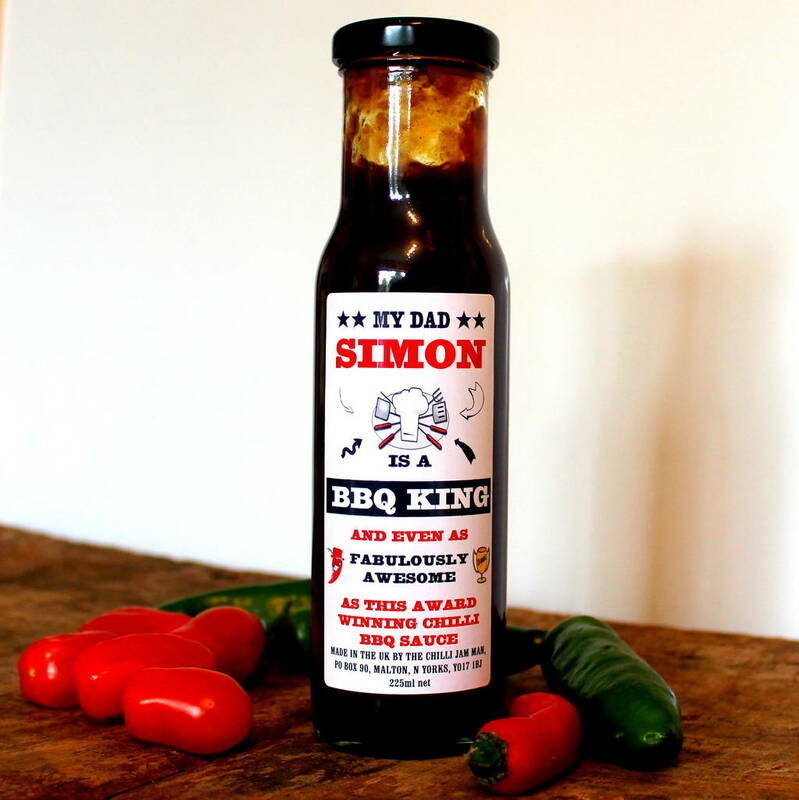 A medium heat, sweet, sticky, fruity, smoky BBQ sauce based on Simmering Smoky Chilli Jam blended into Mango Chutney with some other lovely goodies. 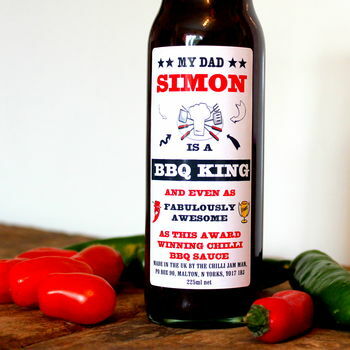 Great for pulled pork, glazing ribs or wings or just for dipping your chips... gorgeous! Ingredients: Mango Chutney (Sugar Syrup, Mango, Salt, Ginger, Chilli, Garlic, Acidity Regulator E260), Water, Chilli Jam (Tomato, Sugar, Garlic, Red Wine Vinegar, Ginger, Chilli, Balsamic Vinegar, Chipotle), Sugar, Red Wine Vinegar, Tomato Puree, Dark Soy Sauce (Water, Salt, Soybeans (SOYA), Wheatflour (WHEAT)), Tapioca Starch. H19 x W5 x D5cm, 225ml net, approx 494g gross. This product is dispatched to you by The Chilli Jam Man.